It seems like most everyone has heard of the "chicken buses" in Guatemala. 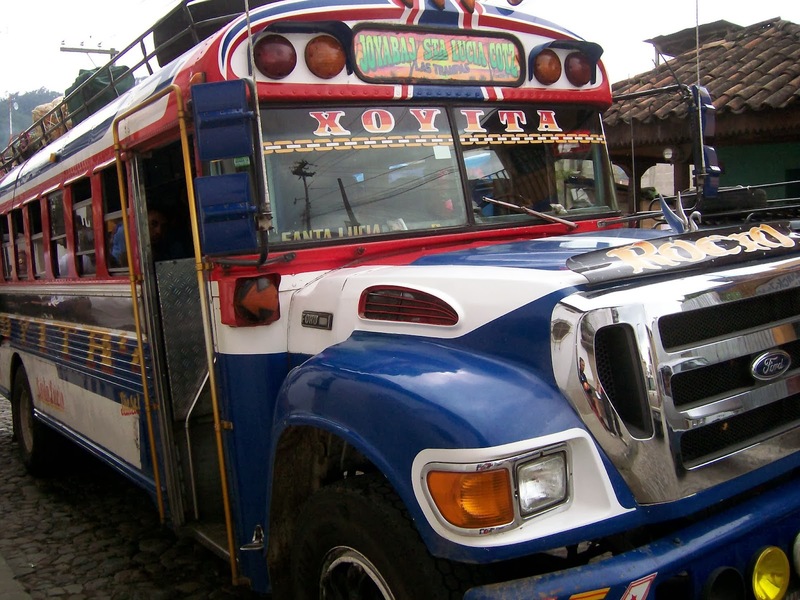 They buy old Bluebird school buses from the US and drive them to Guatemala to be used for regular public transportation. 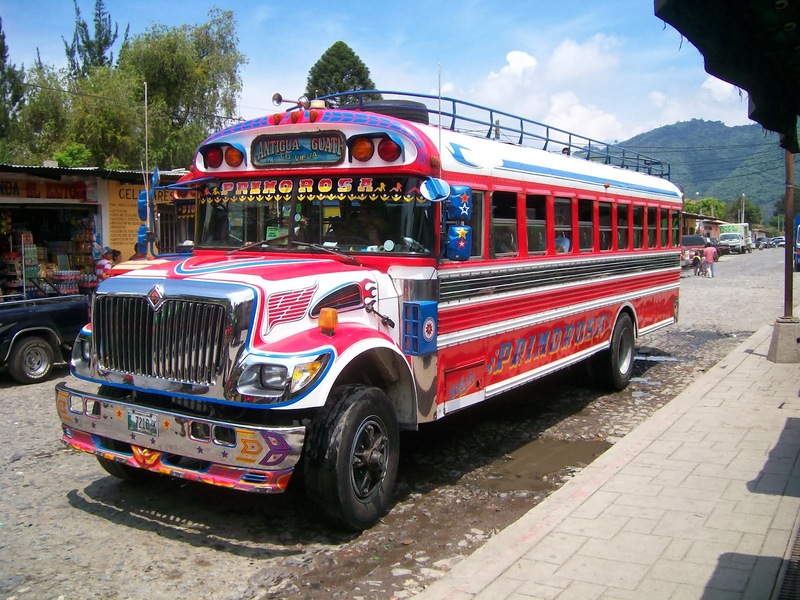 The owners decorate the buses with great care, adding bright paint jobs and sometimes even fancy chrome. I imagine that the regular passengers soon learn to identify the buses by their individual paint jobs and don't even have to wait to read the destination signs on the front. The first time Terry took me to Guatemala, we made plans to take one of these buses from Panajachel to Solola's Tuesday market. He had lived in Guatemala for a while so he was my tour guide - at least until he came down with the flu. I patiently waited around for him to feel better, but we soon realized that if I wanted to see everything, I was going to have to venture out on my own. He gave me a bit of explanation of how it all worked - where to catch the bus and how to identify the route by the sign above the front window. 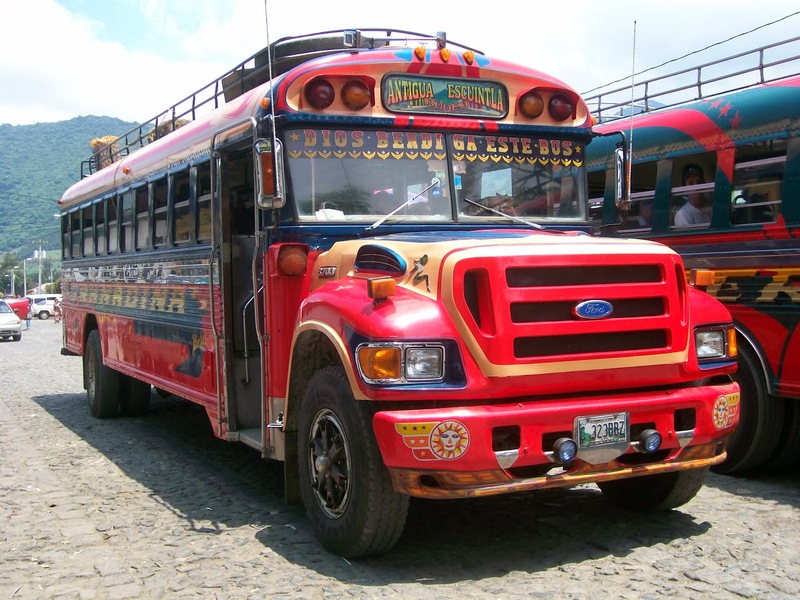 Where to get off would be easy - at the end of the route in downtown Solola. Since it was market day, there would be lots of buses going so I shuldn't have to wait long. 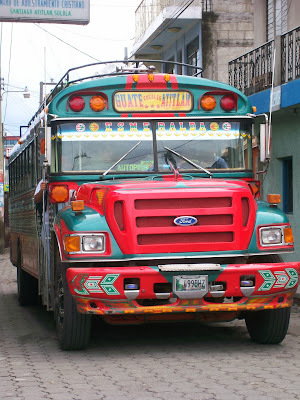 I saw the bus pull in just as I rounded the corner, so I went to the door to ask the driver the price to Solola. He told me that it was five Quetzales. I paid my fair and got on. I chose a seat about half way back and sat down to wait for the bus to leave. It didn't take long for people to start climbing aboard and soon the bus was full. I kept expecting to leave, but we just sat there as more and more people came. Soon the seats that were meant for two children were each holding three adults, and the people still kept coming. By the time the driver and his helper considered the bus really full, we were jammed in four to a seat. The people sitting on the aisles were actually leaning their shoulders and hips against each other to keep from falling on the floor. It was not possible to walk down the isle. I assumed that everyone had paid before boarding the bus just like I had, but apparently not. Suddenly I saw the driver's helper jump up and stand on the metal bar that ran across the top of each seat. He walked along those bars, over the heads of all the passengers, leaning down to collect money from each one. It seemed to me that many people were paying five Quetzales and getting back change, so I was trying to pay attention but it was hard to see over all those heads. As he got nearer it became clear that I had been changed double. That didn't surprise me but he wouldn't get away with it again. The helper had finally collected from everyone and climbed down somewhere at the back. The bus started off up the road. The driver tried to get a running start but he couldn't get going very fast before the road started up the steep mountain. With the bus so badly overloaded, we were soon barely creeping along. Halfway up the hill, we made a stop at San Jorge la Laguna to let a couple off. They were at the back of the bus so the helper opened the back emergency door to let them climb out. He shut the door and we were on our way again. As soon as we got going again, though, the back door suddenly reopened and people started hollering for the driver to stop. It turned out that two people had fallen out the door when it opened. Fortunately, we were still moving very slowly so they weren't hurt. The bus stopped, the people climbed back on and we started off up the hill again. I was happy that the rest of the trip to Solola was uneventful. I knew I had to ride another chicken bus back to Panajachel later that day, but I decided that would be my last one! Note: The first four photos are mine but the last three were found on the Internet. Loved it! This is the kind of stuff that fiction writers just can't make up. I can almost smell the poultry! Actually, I forgot to mention the chicken across the aisle, but I could barely see it with all the people. Nice read! I just went through your blog and found it pretty interesting as I have never heard about chicken buses. I must say those buses are looking really cool. I wish I would have traveled through these buses.